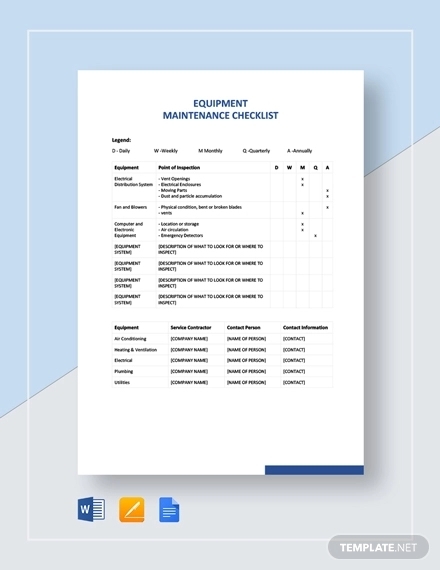 A checklist template is a tool which typically list items, tasks, or points to be considered or acted upon. A checklist, in most cases is used to aid the human mind on things which are a bit too much for us to handle or remember. 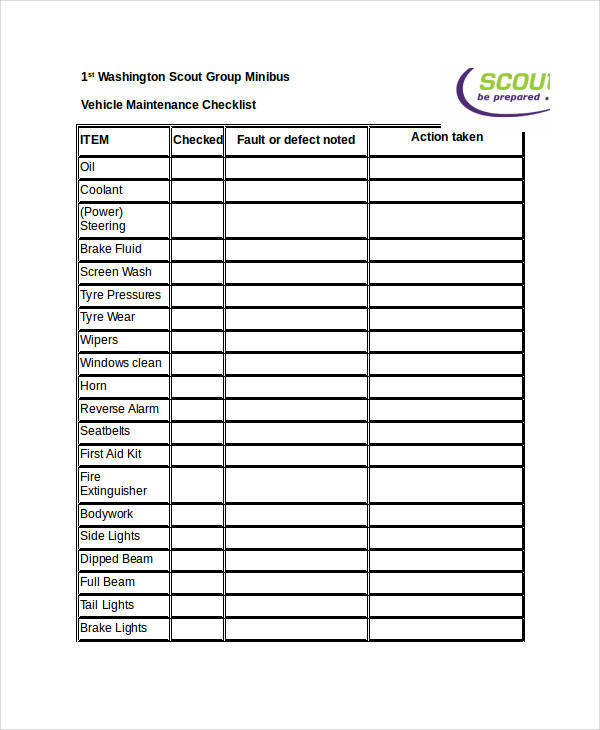 A checklist is often used in order to ensure that the task and the things for consideration were completed, without missing a thing or two. Here, we are going to discuss a few points about maintenance checklists. 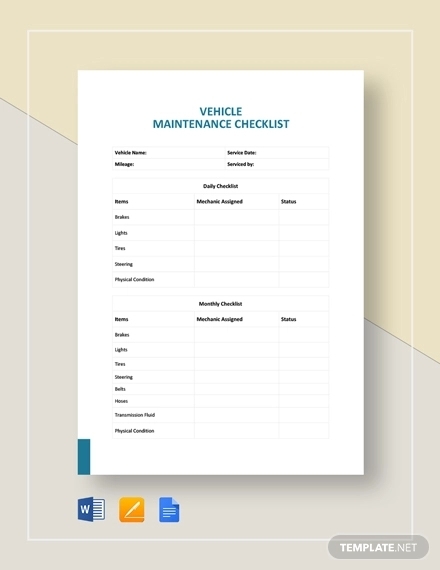 A maintenance checklist is a document which contains a few items to be checked or reviewed for maintenance (e.g. vehicle, appliance, etc). It also points out the things which have been reviewed (usually marked) in order to avoid reviewing the same item more than once. 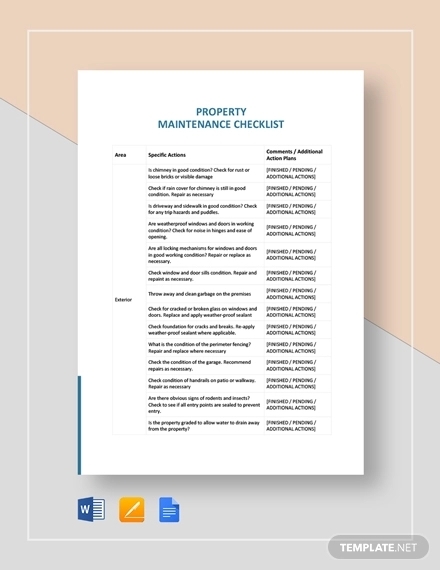 A maintenance checklist typically contains the items for consideration, reason for maintenance checklist (if not a routine check), and remarks from the maintenance officer. 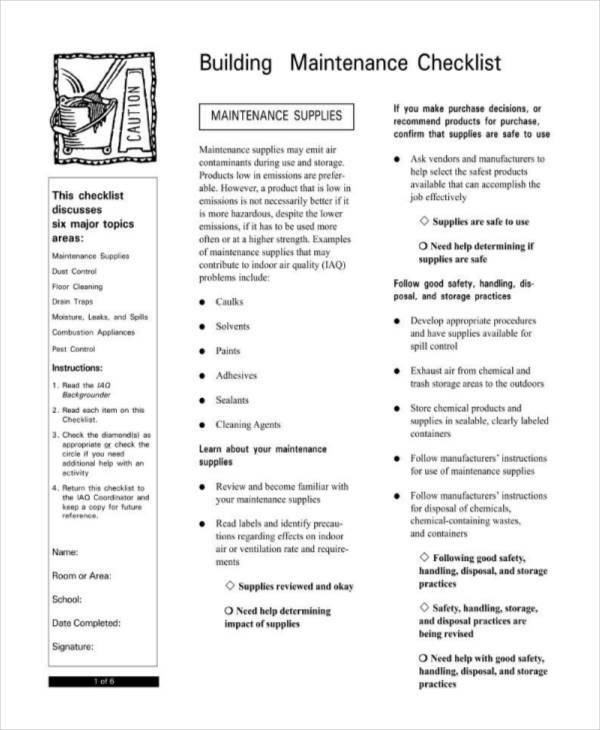 At times a maintenance checklist may also include several items, such as date of maintenance, description for every item, instruction on how to conduct the maintenance check, etc. 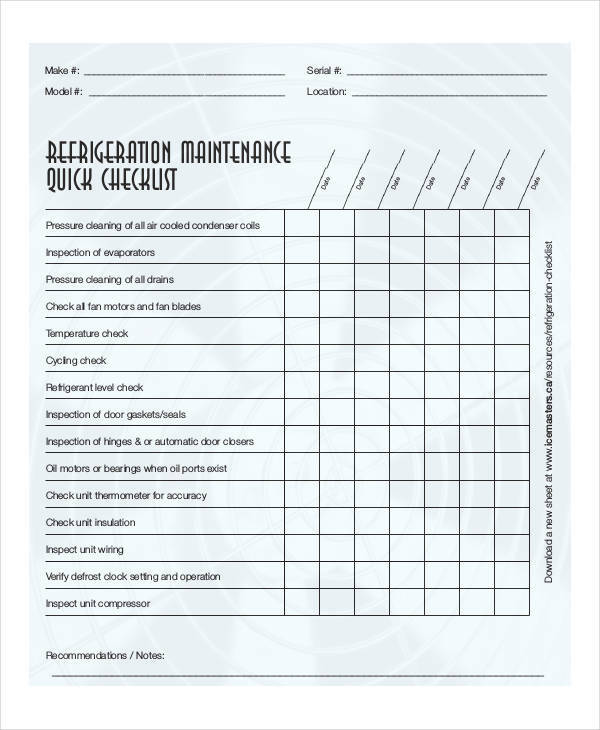 A maintenance check is intended to check certain materials or equipment of a certain area, usually to check their safety checklist for usage. 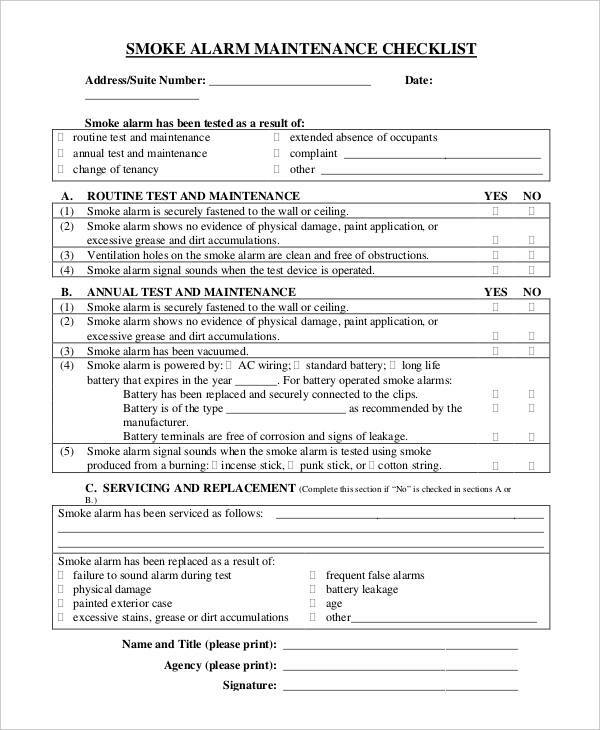 Buildings are subject for routine maintenance checks to ensure the safety of the building occupants. 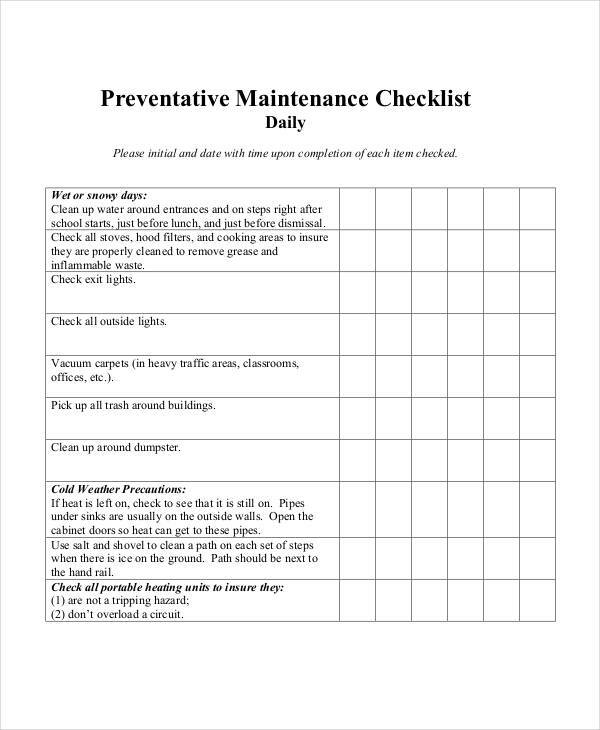 A maintenance checklist is a tool needed by a maintenance officer in conducting a maintenance check. It primarily guides him/her in efficiently conducting the maintenance check. 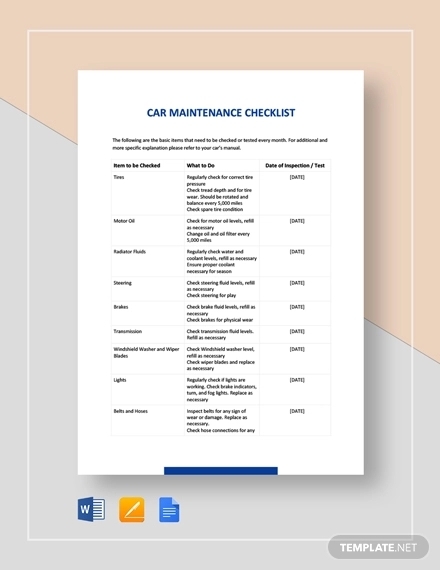 It lists all the items to be considered, which helps the maintenance officer in remembering the things which he/she has yet to consider. A maintenance check is a process which needs careful consideration, so a maintenance officer is not someone who can afford missing something upon conducting a maintenance check. 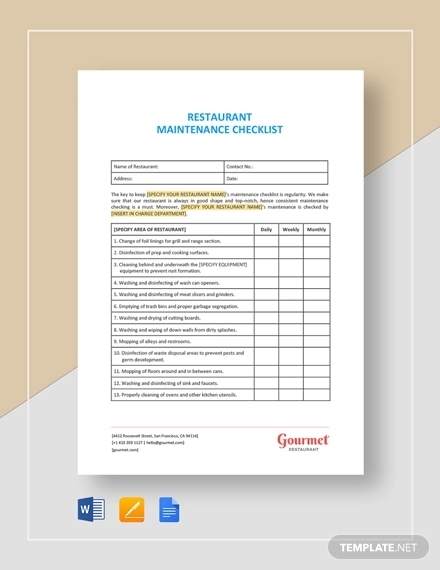 Writing a maintenance checklist is as critical as conducting the maintenance checklist itself. 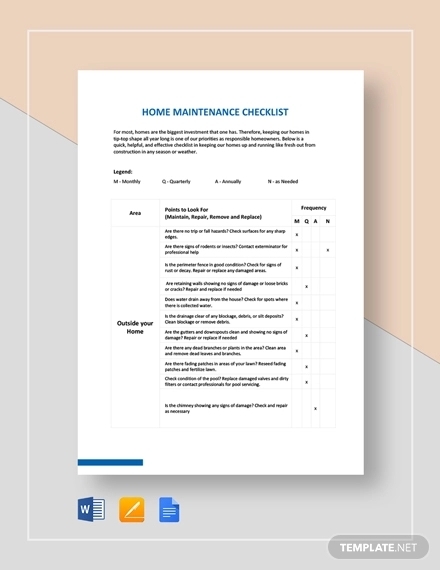 Thus, it is important for someone writing a maintenance checklist to know the basics of writing a maintenance checklist, or at least, a checklist in pdf. 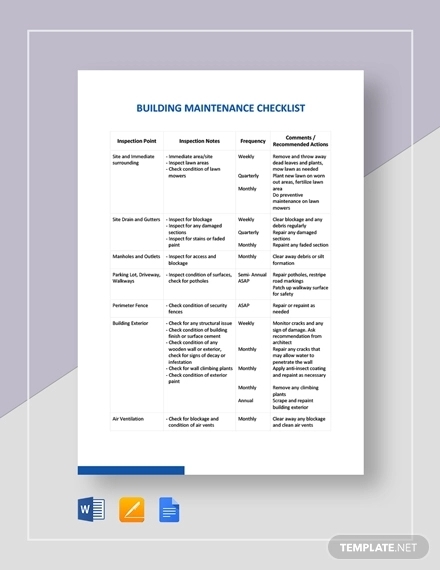 Know the importance of creating a maintenance checklist. You can write this and put it at the top. 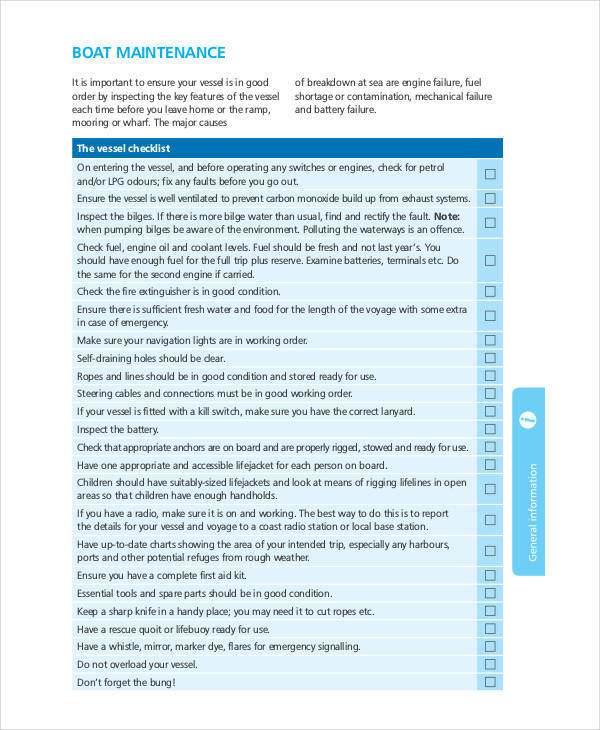 Carefully consider the items to be included in the checklist. 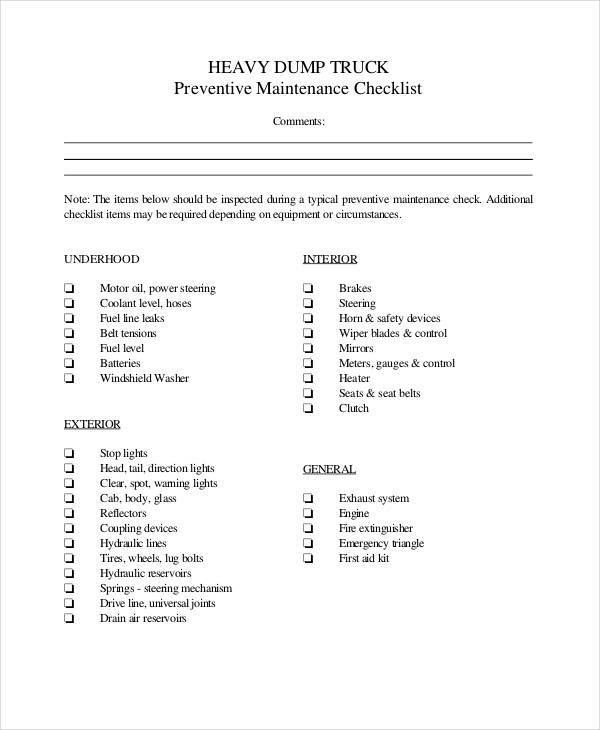 For a maintenance checklist, consider the items which need to be checked. 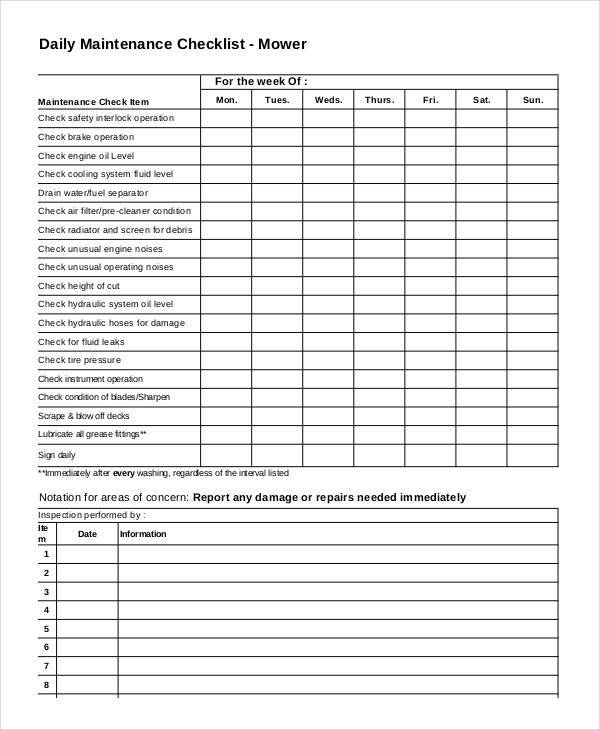 List down the processes needed for a successful maintenance check. Some maintenance officers prefer reviewing the processes from time to time, so it would be better than not to include a few instructions. Write a detailed description for each item. You might want to write a description for a few items to be checked for easy identification. Input the details in an organized manner. 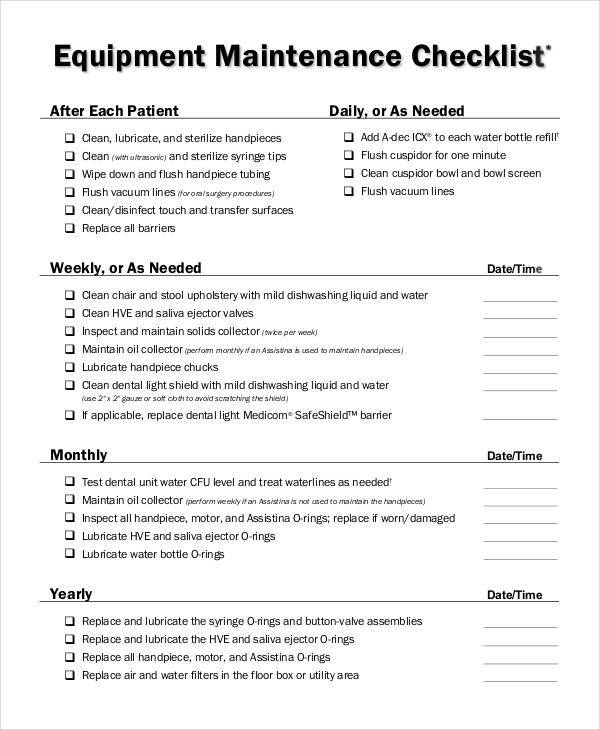 Organize your checklist so the maintenance officer won’t have a hard time finding the items. Leave a blank for the remarks of the maintenance officer. Maintenance officers may find a few observations which need to be noted, and might need a space for such remarks. Add a few details and finishing touches for your checklist. Should you find a few details to add into your checklist, you are free to add them into your checklist.